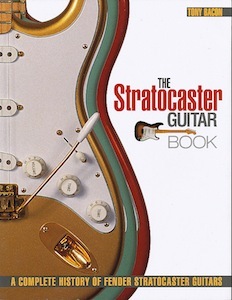 I opened this book with a quote from Don Randall, the sales boss at Fender during the company’s classic years, telling me about the original inspiration for devising the Strat. “The Esquire and Telecaster are pretty ugly guitars when it comes right down to it,” he reckoned. “We needed a fancier guitar.” Fender got quite a bit more than a fancy upgrade. What can you say about the Strat that hasn’t already been said? Well, a good deal of it is contained in the 160 pages of this book, which we published in 2010. When my Telecaster Guitar Book appeared two years later, they made a handsome pair of which I was very proud … and still am. You can read an extract from the 70s portion of the main story from the Strat book by clicking on the link here. Always in my books I want to show the whole story, not just this or that “vintage” period or golden era, or any of the other terms for the supposedly best years of a company’s production. So here, as usual, you’ll find plenty about all the myriad variations of the Strat that Fender has produced since the model first appeared on the company’s 1954 pricelist (at $249.50, or $20 less if you didn’t want the vibrato). Here’s a link – click here – to a radio item about a Strat anniversary where I’m one of the interviewees talking to NPR, way back in 1994.